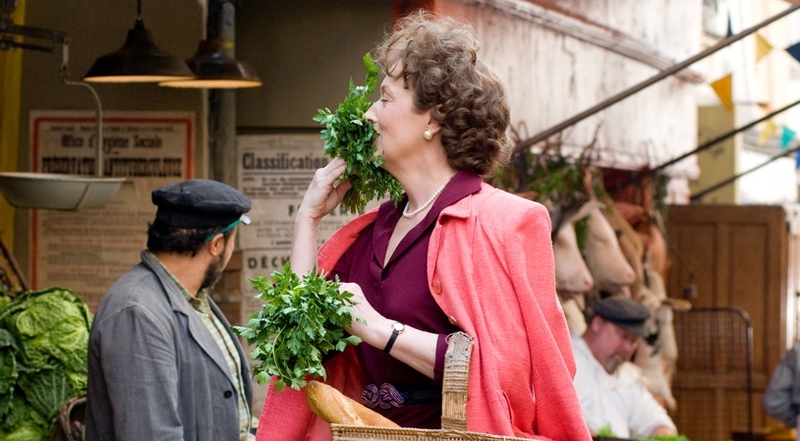 This recent biopic about American chef (of French cuisine) Julia Child will probably not interest children under 8 at all, but I think it's an excellent choice for family movie night if your children are just a little older. Julie & Julia tells the story of Child's start in the cooking profession and is intertwined with a story about Julie Powell's blog chronicling her attempt to cook every recipe in Julia Child's first book . Meryl Streep, who plays Child, is terrific, as always, and keeps the film humorous and entertaining enough to hold the interest of the kids, tweens, and teens who have, of course, never heard of Julia Child. Since Julia learned her cooking skills at the world-famous Cordon Bleu cooking school in Paris and then formed the L'Ecole de Trois Gourmandes cooking school in Paris with two other Cordon Bleu students, we have - voilà - a movie with gorgeous Parisian scenery. My favorite scenes are when she's exploring the street markets of the city with so much joie de vivre! The movie is rated PG-13 for language. There's one f-bomb and a few other nasty words, but my 10 year old son didn't even notice. He was actually engaged in the story. Watch the trailer here to see for yourself. Bon appétit. LOVE LOVE LOVE this movie! Read the book years and years ago and was so inspired by the fact that Julia Child was 37 before she ever even took a cooking lesson! Love the Paris scenery and the romance that Julie and her husband have for each other. Two very enthusiastic thumbs up for this one! Adore this movie! I had no idea that Julia Child was such a character.